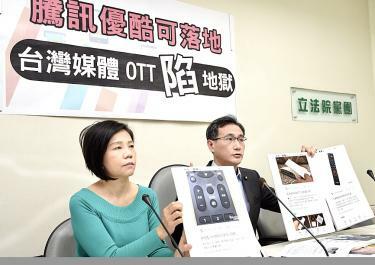 Democratic Progressive Party legislators Yeh Yi-jin, left, and Cheng Yun-peng display information about video streaming services by Tencent Holdings and Youku Tudou at a news conference at the Legislative Yuan in Taipei yesterday. Democratic Progressive Party (DPP) lawmakers yesterday called on regulators to block Chinese media corporations from establishing a foothold in Taiwan, after the Chinese-language Liberty Times (sister newspaper of the Taipei Times) reported that Tencent Holdings (騰訊) and Youku Tudou (優酷) plan to start offering local video streaming services in May. 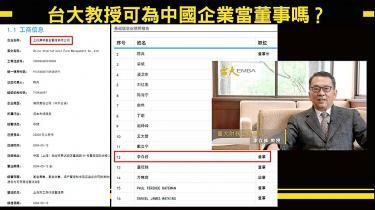 A composite image released yesterday by New Power Party Legislator Huang Kuo-chang shows a photograph of National Taiwan University finance professor Lee Tsun-siou together with a table, indicating Lee’s directorship of Shanghai-based China International Fund Management Co Ltd.
National Taiwan University (NTU) finance professor Lee Tsun-siou (李存修) engaged in illegal part-time work by sitting on the board of directors of China International Fund Management (上投摩根基金管理), an investment fund company wholly controlled by the Shanghai Municipal Government, New Power Party (NPP) Legislator Huang Kuo-chang (黃國昌) claimed yesterday. A visiting US official responsible for religious freedom yesterday urged the Chinese government to release jailed Taiwanese democracy activist Lee Ming-che (李明哲), who is serving a five-year prison term in China on charges of subversion of state power. US Ambassador-at-Large for International Religious Freedom Sam Brownback, who is visiting Taiwan for a regional religious freedom forum, the first of its kind, made the call during a news briefing in Taipei after a meeting with Lee’s wife, Lee Ching-yu (李凈瑜). 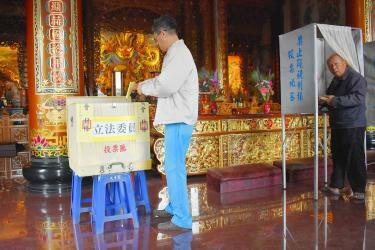 Taiwan’s democratization has often been touted as a model for other countries. While the compliment is uplifting and fitting recognition of the blood, sweat and tears shed by local democracy pioneers, there is more that Taiwan should and could do than being a mere example. Rather than passively standing tall for others to look up to as a model of democracy, Taiwan should take the initiative and offer a helping hand to those who still struggle for freedom and face grave human rights violations, particularly at the hands of the Chinese Communist Party. Supporters hold signs yesterday protesting the forced eviction of the Wang family from their home in Taipei’s Shilin District. Following overnight protests that descended into violent clashes between demonstrators and police, the Taipei City Government yesterday evicted the owners of two buildings in Shilin District (士林), demolishing their homes to make way for an urban renewal project. The project, under which a construction firm plans to turn an old residential complex for 38 households into a 15-story high-rise apartment complex, was stalled for three years because of opposition from a family surnamed Wang (王), who had lived in two two-story apartment buildings in the area for more than a decade.